My first novel has a complete new look — a new cover, and a polished new text. English artist Jane Dixon-Smith of JD Smith Design created the new cover. It again features the Eiffel Tower, but in color, and in a more somber photo than the first edition cover. Jane also designed the cover of my next novel, Last Stop: Paris, which will be published in a couple of months. I wanted the cover of Treasure to be similar in spirit to the new one, which I’ll show you in a day or two, after the paperback proofs arrive from the printer. 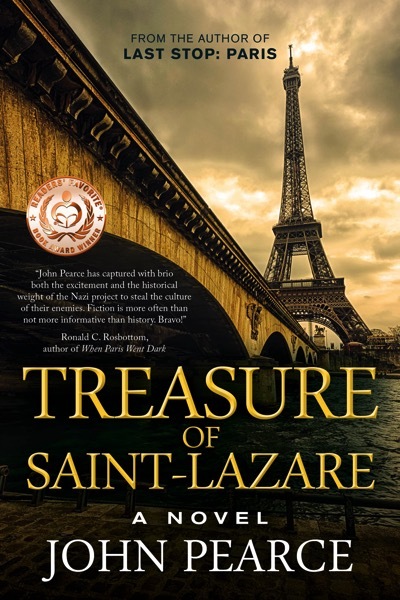 Treasure’s new cover also includes a complimentary blurb from Ronald C. Rosbottom, author of When Paris Went Dark, which is a finalist for the American Library in Paris 2015 book award. It’s a fascinating book for those who love Paris or want to know about the German Occupation during World War II, and I highly recommend it. I have also lightly edited the text but made no major changes to plot or characters. The new edition is available in the Amazon Kindle store today, and will replace the paperback first edition in about two weeks.